Fake Android Virus alert says "Your Mobile compromised by Chinese Hackers"
Fake virus alert is the technique used by the Cyber criminals to trick users into thinking their system have a virus then tell them to install or buy fake applications, sometimes redirect them to spam websites. 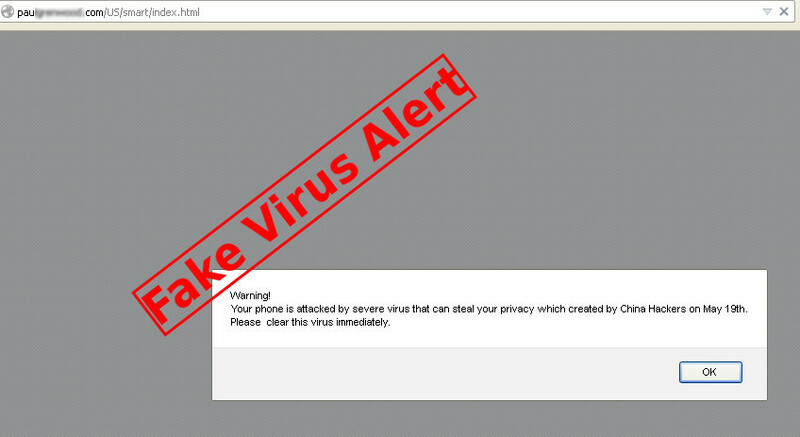 A New fake virus alert spotted by Malware Bytes team says users that their device infected by a dangerous virus created by Chinese Hackers. "whoever put this one together is watching all those APT news stories with glee and weaving them into their efforts below." Malware Bytes blog post reads. Warning! Your phone is attacked by severe virus that can steal your privacy which created by Chinese hackers on [date]. Please clear this virus immediately. There is another fake warning message on the next page with “Android App on Google Play” button underneath the message and list of infections. A rotator URL (clmbtrk(dot)com/?a=17990&c=81777&s1= ) is being used to send visitors to a variety of random adverts depending on geographical location. There’s no infection, so no need to panic.